This concept has multiple interpretations. The symbols can be seen as a clock, a gage or a speedometer — all pointing to 60. 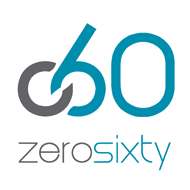 The outer circle of hash marks is also the shape of a zero, furthering the multiple meanings and visualization of 0-60. 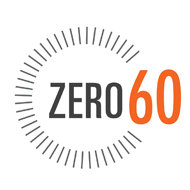 The logo can be used with or without spelling out the zero. 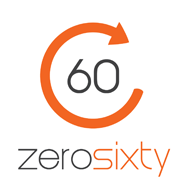 This concept focuses on the iconicity of 0-60. Visually representing this movement is a partial 'zero' with an arrow. Similar shapes are seen in internet browsers as "refresh". 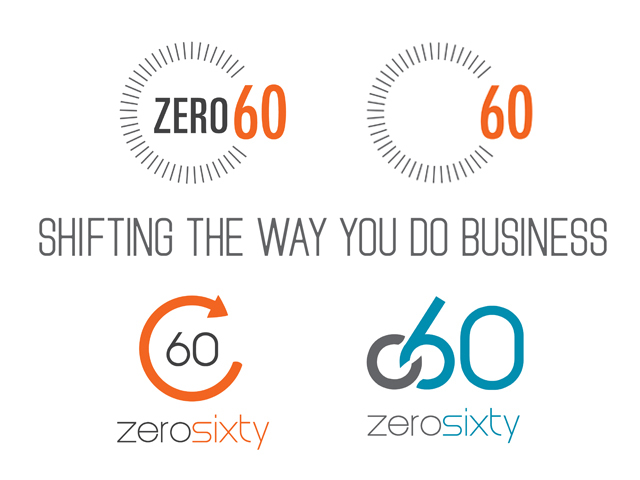 Refresh is a great word to represent what ZeroSixty does. It is a positive way to say "get your company moving in the right direction". The use of the color orange gives the feeling of speed and urgency in which your problem will be solved. This concept is an abstract representation of the transition from 0-60. The interlocking numbers, in combination with changing colors, visually represent this movement. Clean lines and contrasting thickness give the logo a modern, sophisticated look.